Terriers are taking on cross-town rival Northeastern in their final home game of the season. BU’s first match-up of the season comes on Senior Night as five senior skaters will be recognized. Puck drop is set for 7 p.m. with the senior night activities beginning at 6:45 p.m. The Jack Parker number retirement will take place during the first intermission. BU’s three top scorers are Robbie Baillargeon (23 points), Ahti Oksanen (22) and Danny O’Regan (21). The Huskies are led by Kevin Roy (42 points), Mike Szmatula (36) and Braden Pimm (31). Goalie Clay Witt has a 2.17 GAA and .940 save percentage. ● USCHO Hockey East picks and predictions. ● College Hockey News Tale of the Tape. 2014 recruit J.J.Piccinich (photo-right) scored the deciding shootout goal as Youngstown edged Dubuque, 5-4. 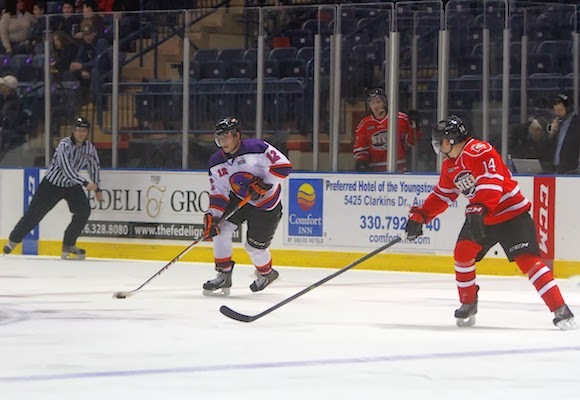 2015 recruit Maxim Letunov’s (photo above) backhander—assisted by Piccinich—midway through the third period gave the Phantoms a 4-2 lead, but the Saints rallied and sent the game to overtime when former Terrier Alexx Privitera scored on a one-timer with ten seconds left in regulation. Letunov, who also had an assist, improved his scoring line to 14-19-33, while Piccinich, who received a 5-minute major for the first fight of his USHL career, now has 47 points (25G, 22A). 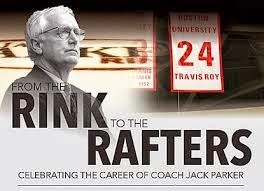 The retirement of former head coach Jack Parker’s number from his playing days will take place during the first intermission of tomorrow’s Senior Night game against Northeastern at Agganis Arena. Originally set for the Feb. 14 game postponed by a snowstorm, the ceremony will have Parker’s #6 will join Travis Roy’s #24 in the Agganis rafters. The game will air live on NESN. Senior night activities honoring five seniors will be held prior to the 7 p.m. puck drop. Those seniors are co-captains Patrick MacGregor and Garrett Noonan, Jake Moscatel, Anthony Moccia and Matt Ronan. ► The ice surface at Agganis was dedicated as Jack Parker Rink in October 2005. 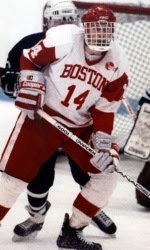 Episode 19 of Inside BU Hockey features Bernie Corbett’s interviews with Head Coach David Quinn, Senior Co-Captain Garrett Noonan and former Terrier standout forward and NHL player and coach Joe Sacco. Noonan recently scored his 30th career goal, making him the first BU blueliners to do so since Vic Stanfield in the mid-1970s. 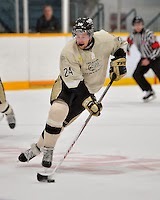 Sacco was a 128 point scorer (63G, 65A) in three varsity seasons. As a junior in 1989-90, his 28 goals were tops on a BU squad that put on a stirring post-season run to reach the NCAA Final Four. 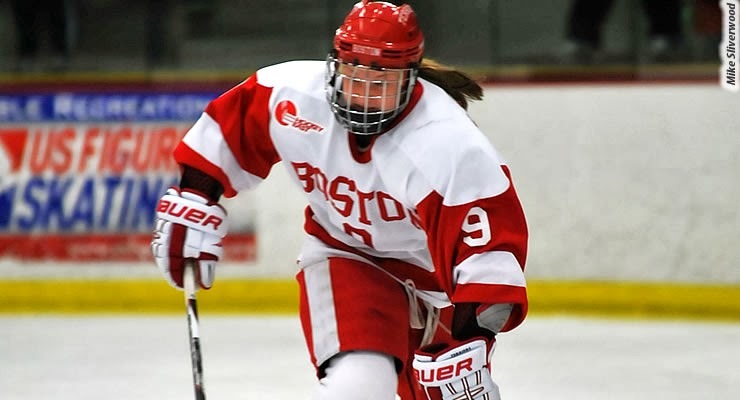 During the Hockey East best-of-three quarterfinals against Northeaster, with BU facing elimination, Sacco scored all five goals in a 5-2 win followed the next night with a clinching win against the Huskies. After BU, the Medford, Mass., native spent 12 seasons in the NHL, scoring 94 goals and 119 assists, before beginning a coaching career. After season seasons in the AHL, he took the reins of the Colorado Avalanche for four seasons and now is an assistant in Buffalo. 2016 recruit Clayton Keller, a sophomore on Shattuck St. Mary’s prep, enjoyed another solid weekend for the Sabres. In SSM’s 5-3 win against Culver Academy, Keller an even-strength goal and a short-hander, while 2014 recruit Chase Phelps tallied an assist. 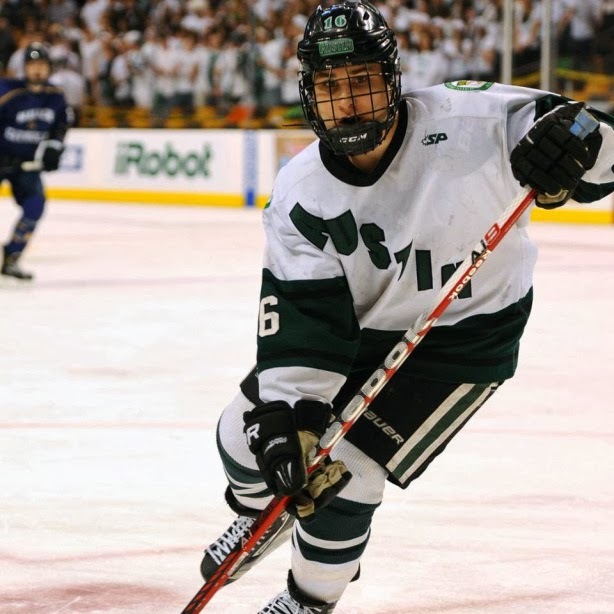 Former Terrier All-American and Hobey Baker finalist John Curry has been called up to the Minnesota Wild from AHL Iowa. 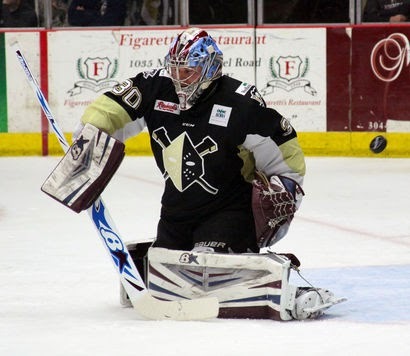 The Sherwood, Minn., native had recorded a 2.08 GAA and .935 save percentage in 14 AHL games. Curry had previously played four NHL games for Pittsburgh. BCDwire.com offers a well-written profile of former BU defenseman David Warsofsky who is back in Providence awaiting his next call-up to the Bruins. Sophomore Sarah Lefort, who leads Division 1 with 29 goals, was named one of ten finalists for the Patty Kazmaier Memorial Award, women’s hockey’s version of the Hobey Baker Award. The Quebec native is the first Terrier to be named a finalist and is the only Hockey East player in the group. Hockey East’s Player of the Month in December, she is tied for the conference lead in game-winning goals (4) and plus/minus (+21). Her next goal would make Lefort the second Terriers to score 30 goals in a season. 2014 recruit Jack Eichel (photo) scored twice and added an assist in the NTDP U18s 5-4 loss to the Indiana Ice on Sunday. With the U18s trailing 5-2 entering the third period, the 6-2 center converted on a power play midway through the period and then again in the final minute to cut the margin to one. In two weekend games against the Ice, Eichel had a combined six points (3G, 3A), which earned him USHL Forward of the Week honors. The two-game outburst extended his scoring streak to 10 games (7G, 12A) and his season total to 60 points in 36 games. Playing in the World Junior Championships as an under-ager, Eichel scored a power play goal, added four assists in five games and was regularly on the ice in key situations. "Ori Abramson is an imposing figure on the blue line. Standing 6'5 and 220 lbs., Abramson moves and skates extremely well for his size. Ori possesses a heavy shot from the point, a strong stick defensively and is well versed in joining the rush in transition from defense to offense." For the second weekend in a row, 2015 recruit Maxim Letunov (photo) set up an overtime winning goal for Youngstown. 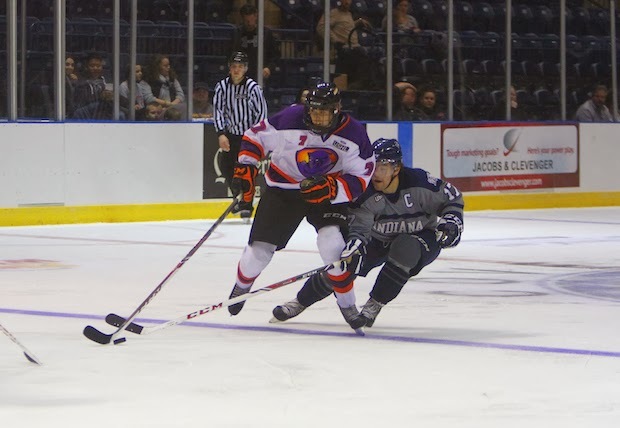 On Sunday, he had the primary assist on both Youngstown goals with the game-winner coming 27 seconds into overtime, as the Phantoms edged Chicago, 2-1. A week earlier, his slick goal-mouth pass led to the GWG in a 4-3 win over Des Moines (video). The center from Moscow now has a 14-19-33 scoring line in 46 games, third best on the Phantoms. 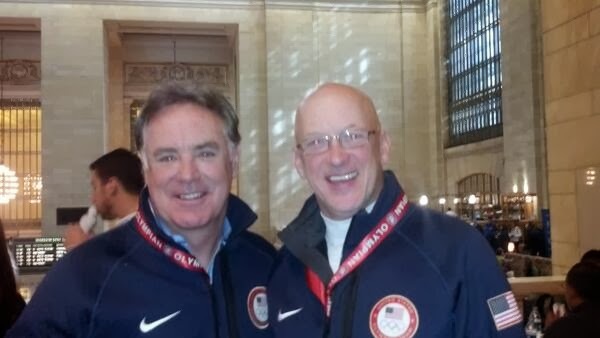 34 years after Team USA completed the “Miracle on Ice” with a 4-2 win against Finland, a Boston Globe sports blog caught up with goalie Jim Craig who talked about Lake Placid (1980) and Sochi and the occasional pleasure of anonymity. 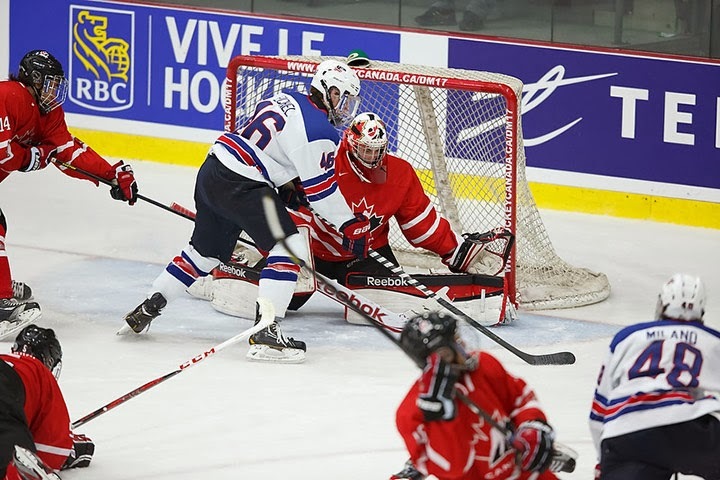 The article includes video of the final minutes of the gold-medal game. 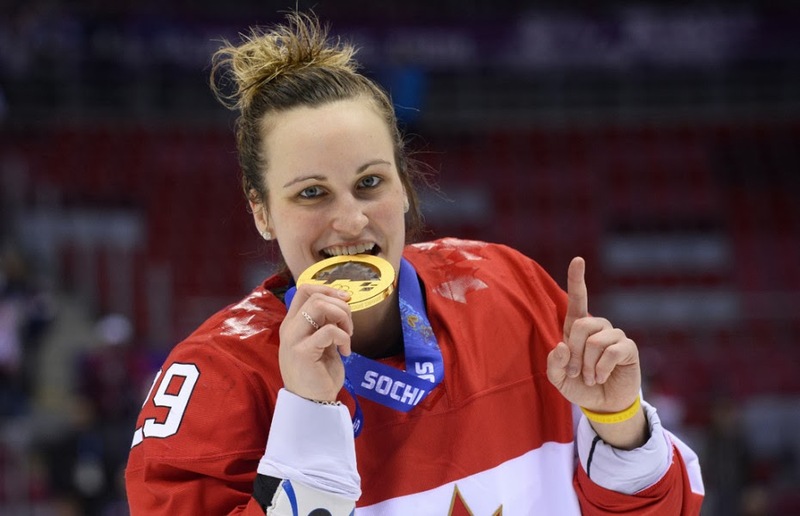 Canada.com looks at 2010 and 2014 Olympic “hero” Marie-Philip Poulin through the eyes of Terrier teammate Louise Warren. Poulin has scored a combined four goals in two gold-medal games, including the game-winner in each game. Brandon Yip scored a goal and an assist for Portland but the Pirates were edge by St. John’s 6-5. Friday’s script was repeated Saturday as the Terriers were blanked again at Notre Dame by the same 2-0 score. Sophomore netminder Sean Maguire dueled Notre Dame’s Steven Summerhayes evenly throughout two scoreless periods. But the hosts converted just 19 seconds into the third period on Jeff Costello’s power play goal after a Garrett Noonan penalty late in the middle stanza carried over to the start of the third. Austin Wuthrich, who had scored Friday’s game-winner, doubled the Irish’s lead with two-and-half minutes left. Like Matt O’Connor on Friday, Sean Maguire was exceptional in goal stopping 38 shots and earning second-star honors. BU suffered back-to-back blankings for the first time in 72 years (1941-42). 2015 recruit Bobo Carpenter played a pair of games this weekend for the Sioux City Musketeers, the USHL team that had added him to their roster on February 7. 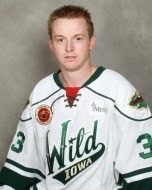 Carpenter recorded an assist in last night’s Sioux City 6-5 win against Des Moines. Earlier in the week, Carpenter scored four goals for Austin Prep in a 6-0 win against Hingham. Carpenter has 21 goals for the this season for the Cougars, despite missing time with an injury. Ranked #146 in the NHL Central Scouting midterms, Carpenter had been coached at the 2013 USA Select 17s development camp by Musketeers coach Jay Varady. If he plays 10 games with Sioux City this season, he’ll become property of the USHL team. 2014 recruit Jack Eichel scored a goal and two assists in the NTDP U18s’ 4-1 win against Indiana last night. The 6-2 center, who earned the game’s second star, now has a 26-31-57 scoring line in 35 U18 games. 2014 recruit AJ Greer scored the first goal for Kimball Union in the Wildcats 4-1 win over Vermont Academy in the Lakes Region tournament semi-final on Friday. Greer is a co-captain of KUA which won yesterday’s tournament championship defeating Proctor Academy, 4-2. Next up is the NEPSAC tournament. Kerrin Sperry made a season-high 47 saves, but the Terriers yield two third-period to BC and the Eagles came away with a 3-2 victory at Conte Forum. The Comm Ave. rival were tied at a goal apiece after one, with BU getting a goal from Lillian Braga, assisted by Louise Warren and Dakota Woodworth. Terriers took the lead in the middle period on Warren’s 24th goal from Braga and Kaleigh Fratkin. The hosts knotted the score midway through the final period and nailed the game-winner with just five seconds left in regulation.